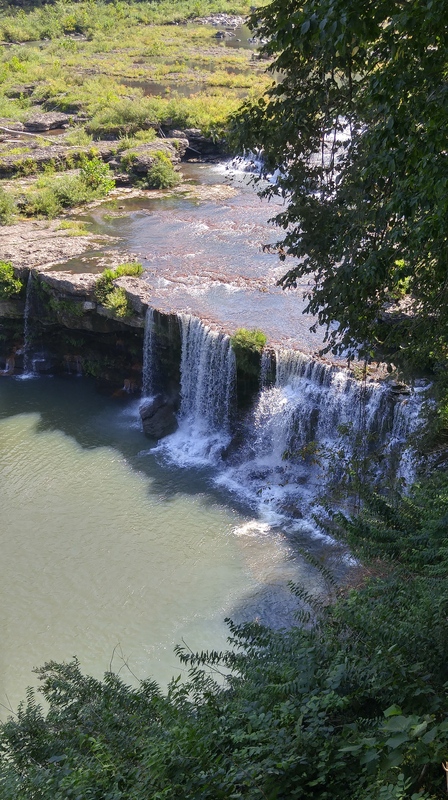 Our first adventure in the pop-up camper took us to Rock Island State Park in McMinnville, Tennessee. 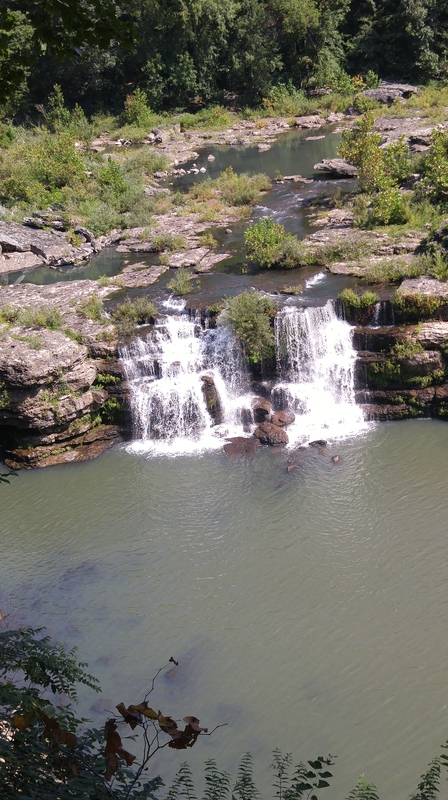 As described on Tennessee State Park’s website, Rock Island State Park is an 883 acre park located on the headwaters of Center Hill Lake at the confluence of the Caney Fork, Collins and Rocky Rivers. 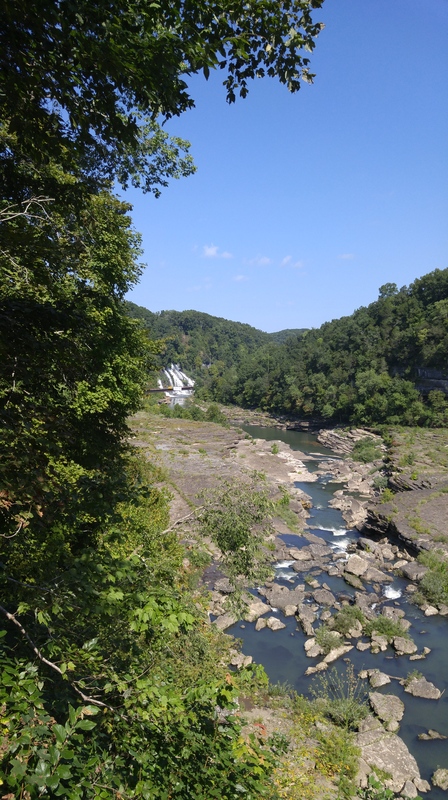 The rugged beauty of the park includes the Caney Fork Gorge below Great Falls Dam. These overlooks are some of the most scenic and significant along the Eastern Highland Rim. Great Falls is a 30 foot horseshoe cascading waterfall, located below the 19th century cotton textile mill that it powered over 100 years ago. What could be better? Camping, fishing, kayaking, waterfalls, hiking and history all to explore. For us Cleghorn Camperz, the answer to that question is absolutely nothing. What could be worse? Just keep reading, this story gets more interesting. It being the Labor Day holiday weekend we had already expected the park to be full, so we wanted to get in as soon as possible. Our plans were to leave out Thursday evening after work and make the drive. It took us approximately 4 hours to drive from our home in Buford, GA. We arrived at the campground after dark and I was concerned we would have difficulty getting all set up, however we found the park and campsite #9 with no problems. The park has 50 sites in the main campground and an additional 10 tent only sites in another section. The campgrounds and facilities are smaller than most I’ve stayed at, however the scenery over compensates for what the campground lacks. We were able to back the pop-up into our site easily as there was a double parking area, one for a camper and one for a vehicle. We popped up the camper and as quietly as possible, unloaded our things from the truck and threw the pillows and blankets on the bed. It was difficult to judge the campsite in the dark but it didn’t matter because we were here and it was the only site we were able to come by waiting a week prior to arrival to make reservations. I did manage to get a good look at the bathhouse, which was situated about 6 sites away from where we were parked. It was clean with two showers available to use. This being our first time staying in the pop-up, I was happy at how well we slept. Our dogs seemed more comfortable in our new set up as compared to the tent we have ditched. After a delicious breakfast (cooked on our outdoor stove) we set out to do some hiking and explore the numerous sights that the park has to offer; Great Falls, Horseshoe Bend, Twin Falls and the Blue Hole. We also wanted to get a 3 day fishing license. First stop was the park office, where we found they do not sell fishing license. Luckily for us, Rock Island Market, right outside the park does sell them, as well as fishing supplies, and bait. When you step inside the store, you can smell the country kitchen that serves breakfast, lunch and dinner. It wasn’t until the day we were leaving to come home that we found out they have the best country fried steak biscuits either of us have ever tasted. Good enough we are looking forward to going back for another visit. Before we exited the park to get the fishing license, we pulled into a parking lot near the damn, which offered an overlook of the Great Falls and the Historic Cotton Mill. There was also a hiking trail, which we didn’t go down, mainly because the view was awesome from above coupled with the fact that we wanted to get those fishing poles cast out into some waters. After all, the brochure states a variety of catches are common including largemouth and smallmouth bass, catfish, crappie and bluegill among others. We were interested in the “excellent walleye fishing and more recently trophy muskellunge (musky) fishing. I had read the park waters had produced a one-time U.S. record walleye and a Tennessee record catfish. With our new fishing license in hand, we set out for the remainder of what was turning out to be an awesome day. The skies were blue and scattered with white cotton ball clouds that if you’re lucky will form into the shape of a dog or bear. The temperature was going to hit a high of 85, but for the moment it was sitting around 76 degrees. Not knowing exactly where we would drop our lines, we began searching for the perfect spot. We attempted to catch one of the previously described fish from the banks of the Collins River, near the Great Falls Dam, but were disappointed when not a single little fish out there would take the bait. So we packed up and headed to see if the Caney Fork River might look more promising. We ventured out to the Sand Bar beach area, with it’s breathtaking views, but found that the boaters were having a ton of fun racing up and down the river. So again we set out to explore more of the park. We would find the perfect spot and know what to plan for our next day. This time we headed over to Twin Falls. As we exited the truck, you could hear the roaring sound coming from the waterfalls. The dogs seemed anxious as we traveled down a hiking trail, perhaps they could read the warning signs that were posted, advising of dangerous waters that will rise rapidly when siren sounds and/or light flashes and protective floatation devices should be worn when fishing or entering the area. But whatever it was, they were not happy about our choice in location this time around. We left the fishing poles and things in the truck, so we could get an idea of what the area looked like before hauling everything with us. Not to mention it was past lunchtime and we were getting hungry. We were just going to do some sightseeing. Down the path we go, about a half mile down we can overlook into a gorge area and see a few folks fishing in the waters and that is when we spot several very large fish. We become so excited that we decided that I could wait with the dogs (who can be challenging walking both of them on leashes) while Randy heads back up to the truck for the fishing gear. We weren’t going to fish long, just see if that big catfish or whatever type was would provide us with a record. Look close in the photo with the murky water and see if you can spot him. I stood there basking in nature’s beauty and enjoying the sights and sounds while moving in for a little closer look at the fish (we actually saw several) over to a rock landing. Of course, the dogs started getting all nervous and begin to pull back from me and that is when the small camcorder I had in my hand, falls down to a lower ledge approximately 4 feet down. Now I’m in a predicament…the pups have absolutely no interest in going with me to retrieve it, so I take their leashes off (so they don’t get all tangled up and freak out). I instruct them to stay. This is the part of the story that goes from better to worse. As I’m attempting to jump down to the next landing, I slip and fall and as I land I hear the distinct sound of a bone crack in my ankle. I make an attempt to stand and am unable to do so. I’m now in severe pain and I’m the one freaking out, thinking the dogs will run off and Randy will never be able to find me. I reach for my phone only to notice it only has 2% battery life remaining, not that it matters there is no cellphone service in this area. This is like something on a movie and trust me, I am not a very good actress. I attempt to make a call and it goes directly to Randy’s voicemail, so I send him a text (he never receives it) and then my phone dies. I consider screaming out, but the dogs are still sitting on a ledge up above looking down at me. I’m thinking to myself, how in the heck did I let this happen, I’ve ruined our trip now. After what seems like forever, Randy finds me. He says if it had not been for our smallest dog Dixie, who heard him and went running to him, he would have had a hard time finding me. When he discovers that I’m laying on a rock, crying in pain, he drops all the equipment and tries to come to my rescue, by attempting to lift me up. I’m petite in height but not in weight. Of course at this very moment I’m thinking why haven’t I started that diet that I say I’ll start every day. I know there is no way in this world I will be able to make it out of that area without assistance. I convince Randy to head back out of the gorge to find help. This time taking the dogs with him. I sit there another hour thinking about what in the hell I would do, if the waters began to rise dangerously quick. I also thought about all the creatures that could be living under all the small rock ledges surrounding me and “what if” a snake slithered past me. I was feeling very terrified to know just how helpless I was in that moment. I also thought about how I was going to miss that opportunity to catch a big fish. I thought about all the trails I would not get to hike on this trip. Very disappointed in myself. Feeling sorry for myself. Here comes my knight in shining sweat all over his body from his numerous trips up and down the gorge. I also see three young park rangers and I’m feeling pretty darn humiliated at this point. You see, I’m very independent and this is killing me knowing I can’t do this on my own. I felt bad for these young men that they were going to have to carry me, arms around their shoulders and my legs up in their arms, all the way to the top of the hike entrance. They assure me this happens more often than I know and this is what they are trained to do. I may have been more careful, had the warning signs advised of all the falls and broken bones that had taken place, like the signs that had the warnings about the number of drownings that had occurred. However, I’m very thankful to these young men that worked so carefully and compassionately getting me to safety. Sorry no pictures were taken during this part of the trip. The results of the x-rays taken revealed I had a osteochondral fracture along the medial aspect of the dome of the talus that measures 5-6 mm. That’s a whole lot of medical terminology for what I refer to as a broken bone in my foot. We totally missed lunch and by the time we left the Emergency Room at Saint Thomas River Park Hospital, there was also no time for grilling out steaks as we had planned. Now equipped with crutches and a fancy cast, and some pain meds, I was ready to make the best of a bad situation. That chicken salad, fried mushrooms and sweet tea from Zaxby’s sure hit the spot. We did make it safely back to the campground and I was able to roast a couple marshmallows before the pain meds kicked in good. I stayed positive knowing the situation could have been much worse. We managed to have a very relaxing weekend. We took a nice country ride over to another park 30 miles away, Falls Creek Falls State Park and were so pleased by what we saw that we will be planning another camping trip in the future. We did fish, but came up empty handed at every fishing hole during this trip. The scenery in this part of Tennessee is very pleasing to the eyes with rolling hills, rocky mountains, farms with fields and wheat and soybeans. Farmers working the land and families sitting on their front porches, taking life easy. Randy proved to be a loyal, caring and helpful husband, and I can’t forget to mention a good cook too! I’ll be off the adventurous trails for a while as my foot heals, but it won’t be long and I’ll be back. Don’t forget, if you go stop by the Rock Island Market for a steak biscuit. The cost for a campsite with water and electricity was $22.50 per night, plus taxes.